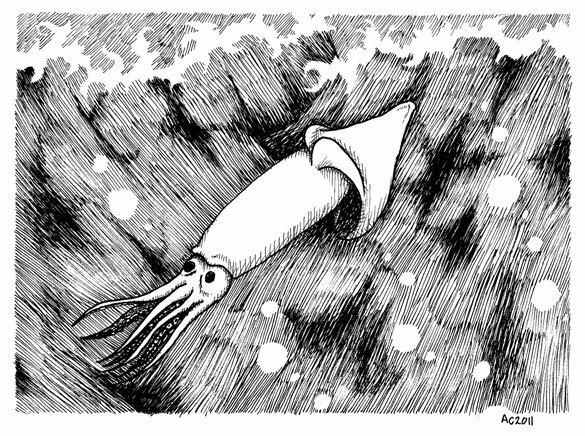 The watery environs of this squid were directly inspired by the cover of The Raging Tide: Or, the Black Doll’s Imbroglio by Edward Gorey. I didn’t even realize it was out of print until just now, though, oops. I’ve been wanting to move away from doing just Sherlock cartoons in this style, and so I went to one of my other dorky fannish loves, cephalopods. This little squid looks like something unfortunate is about to befall him, which seems appropriate for something done in Edward Gorey’s style. Perhaps the black doll will come falling through the water, or maybe the squid will be called upon to help fill out another set of childhood obituaries. 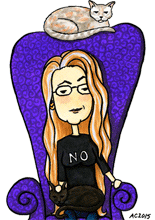 “G is for Gretchen, pulled down by a squid,” perhaps? Squid a la Gorey, 7″x5″ pen and ink on 8.5″x5.5″ drawing paper.